CleverPet is a robot that humans (and dogs) love – LET'S TALK ROBOTS! The largest markets for robots is for when there aren’t any people around. We often call those jobs the dirty, dull and dangerous ones, but then there are devices like CleverPet which play with your dog when you aren’t home. What’s not to love about playing with dogs? And yet there is a huge industry growing up around looking after your pet when you simply aren’t available to do it. 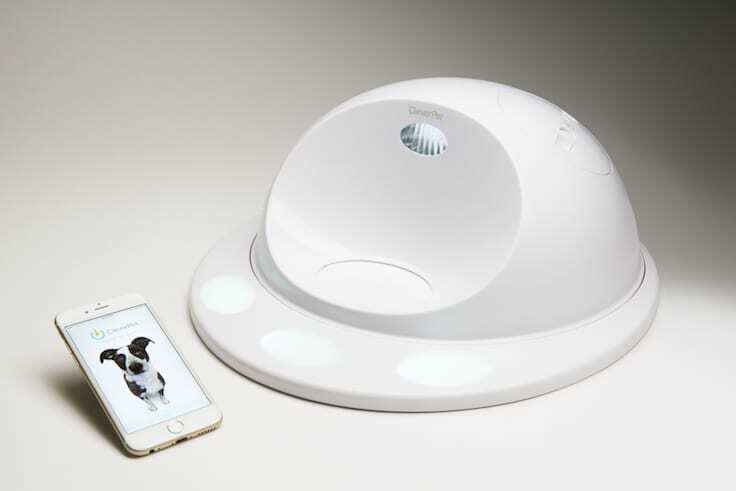 CleverPet won the 2015 Robot Launch startup competition and took home 1st place at CES 2016. In 2017, we are seeing many ‘robots’ advertise themselves as being able to play with your pets or even your children and parents when you aren’t home. What’s really involved in creating a good experience with a smart home robot? CleverPet is very tightly focused in how it delivers value. CleverPet Hub is like a game console for dogs. It teaches dogs to play games and keeps them from getting bored so that you can feel better about the time your dog needs to spend alone at home without you. It has three touchpads that light up in colors that your dogs can see, it has a speaker so your dog and hear your voice, and it’s got a microphone so you can hear your dog bark. In the morning, instead of putting your dog’s food in a bowl, you put it in the CleverPet Hub, and then our software gives your dog a single piece of his food when he does the right action for the game. There’s also a mobile app that will teach you how to use the Hub, and that allows you to see your dog’s progress. I love your description of CleverPet as a game console for dogs. But as someone who’s not a dog owner, it looks rather complicated. How many dogs manage to get past Level 1 on this? Most dogs are able to get to the final level. The techniques that we’re using have been used for decades by trainers to teach agility and tricks to dogs. They’ve also been used in university contexts with a variety of other animals: monkeys, birds, cats, mice, flies. We know that, given the right curriculum, most dogs can be taught to touch touchpads in a sequence, though of course some dogs will take longer to learn it than others. The limiting factor is not the cognitive capacity of the dogs, but their motivation to learn. The problem isn’t getting from Step 5 to Step 10; it’s getting from Step 0 to Step 1, and from Step 1 to Step 2. Those early steps are the most challenging, and it all depends on how curious, food- motivated, fearless, and open-minded the dog is. This is a challenging UI (user interface) problem, because on the one hand this is a product for interacting with pets, and on the other hand, the product has to interact with the consumer — the person who’s buying it, setting it up, and monitoring it. Can you describe a little bit about each of these two streams? Both the person and the dog have to learn a sequence of actions, and at first, the progress is gated primarily by what the dog is able to do at any given point in time. It’s trickier for the dog. People sometimes overestimate what their dog can actually understand, and so they might do things like grab their dog’s paw and put it onto the touchpad. But we don’t want people to interfere with the learning that their dog is doing, because if the dog develops a negative association with using the Hub, it will set the whole learning process back. On the other hand, if this is something that the dog discovers on his own, then he is likely to associate the Hub instead with a new thing that he can do in the world, and that is interesting and exciting to him. Is there a significant population of pet owners who feel that their pets need something like CleverPet? We know that there are people who feel bad about needing to leave their dog alone at home. I have hundreds of quotes from people saying things like, “My dog has separation anxiety and I can’t afford dog daycare. I feel horrible about it, and I wish I could give him something to do during the day.” That’s the ‘why buy?’— the thing that everyone can understand, and why most people make the initial purchase. But what is much more interesting and powerful is the excitement of having a new way to interact with your dog. Most people have a very relatively small area of potential interaction with their dog because it only consists of the times when they can be together (which is intrinsically limited) and because there is no data associated with it. But by adding data, adding more time, and also adding insight through analytics, we can greatly expand the interaction surface in a way that I think people who love their dogs and are desperate to understand them better will find deeply exciting. People love talking about their dogs and showing pictures of them. But now they’re not just going to be showing you pictures, they’re going to be showing you pictures and data and charts and explanations about when their dog leveled up, and why they do well on particular days and not other days, and what kind of progress their dog is making. We’re really excited about developing fodder for this kind of conversation — it will be the reason why we go from being a company that is selling a hundred thousand CleverPet Hubs to one that is selling tens of millions. Are you able to extrapolate information about the mood of pets from this? With this version of the Hub, we’ll be able to make indirect inferences about mood. For example, by looking at how active or inactive the dog is, especially as compared with previous days, we can recognize whether he’s feeling high energy or low energy, which might imply an underlying health issue. Other pet devices are either tele-operated or pure auto-feed or auto-play. 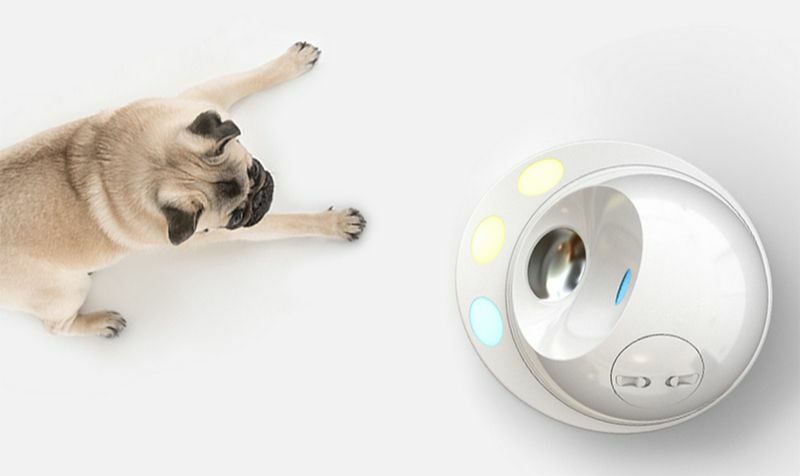 CleverPet stands out by having a smart interaction that adapts to the individual animal. Can you tell us more? The key thing that we’ve got is this combination of input from the person, input from the dog, and all of that is through a flexible interface that is the source of a good chunk of the dog’s food for the day. All this is fed into a framework that allows for relatively sensitive analysis and adaptation. What’s great about computerized interaction is you can be extremely precise: you can provide the feedback at exactly the right time and you can be extremely consistent. In other words, you only provide the feedback when the animal does the right thing, and that is something that humans are notoriously bad at. Computerized interaction also provides great memory, so you can look at what the dog did last week, or yesterday, or ten minutes ago, and you can precisely change the way the feedback works based on all that information. Finally, you can provide the interaction all the time — over the course of thousands of hours a year, rather than merely an hour a day. And this lets you become a fixture in the dog’s world. 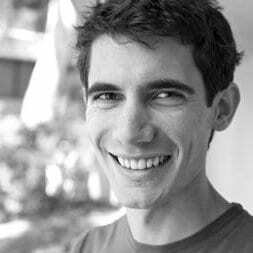 These techniques are well developed in neuroscience and cognitive science, but the potential for computerized interaction with animals is not commonly understood. I did four or five years of cognitive science before I knew that this was available. What led you from Cognitive Science to CleverPet? And why choose animal behavior rather than impacting human behavior? If you asked someone what makes humans special, as compared to other animals, they’ll say: insight, creativity, reason. But anthropologists will say that what made the development of humanity possible over the last 20,000 years are technological developments — like agriculture, science and the development of writing — that allowed us the luxury to develop our insight, creativity and reason. But if technology enabled humans to make these big advancements, what could technology make possible for animals? Especially animals as cognitively sophisticated as dogs appear to be? Now, the counter-argument to that is you look at the performance of babies, at 1 and 2 years old, and compare them to the performances of dogs, and there are things that babies can do that dogs can’t and you can’t attribute the cognitive performance of babies to technological development. There’s a kind of recursive property of trained ability and connections that exist between mother and child, and it might just be that we don’t know what the inputs are to dogs in order to mold their behavior and elevate their performance. There are dogs that seem to have some very sophisticated abilities, and so in the same way that there are humans that can do physics, although they’re in the minority, I believe there’s likely the same amount of heterogeneity in dogs and so that means there’s also potential for us to develop specialization, potentially, in dogs, that gives them additional ability, as much as there’s specialization in people. There are these huge generalizations that people tend to make, about human ability and dog ability, and I think those are all wrong- headed for the most part, because there’s massive amounts of individual difference. When did you launch the first CleverPet prototypes into the wild, as it were, and what have you learned along the way? We did a lot of internal work ourselves. Last summer we set ourselves a rigorous program of sending three CleverPet Hubs out every Friday, for about 12 weeks, and we learned a lot there. There’s still much more to learn: a lot of the value that will develop around this technology has yet to be invented, yet to be developed, yet to be written. But it can only really be developed once this product on the market, and sold. We now have a bunch of CleverPet Hubs coming in from China that we’re very excited about, and we’ll be distributing them so we can begin the next stage of learning. Note – Since this interview the first batch of CleverPets were distributed and the company is now taking orders for Christmas. It’s very challenging to turn a research interest into a consumer product, and so, why this specific market and product? To me the most powerful way of teaching people something is to demonstrate it to them. If I think it would be valuable for people to understand the process of learning and cognitive potential better, what better way to do that then to demonstrate it for them in their home with an animal that they love? That is to me the most powerful way of opening people up to that possibility and making them more curious about it. That’s why it needed to be a consumer product. We want to CleverPet to become a household name. We want millions of dogs to be happier and lead more fulfilled lives, and for tens of millions of people to feel even closer to their dog, and have a much better understanding of what they’re capable of. And we want a general acceptance that there is a whole other world of cognitive behavior change that’s available and technology can help us get there. CleverPet uses smart hardware to offer animals engagement anytime, automatically, whether their humans are home or not. Founded in 2013 by Leo Trottier (Clever Executive Officer), Dr. Philip Meier (Clever Product Officer) and Dan ￼￼￼￼￼￼￼￼￼￼￼￼￼￼￼￼￼￼￼￼￼￼￼￼￼￼￼￼￼￼￼￼￼￼￼￼￼￼￼￼￼￼￼￼￼￼￼￼￼￼￼￼￼￼￼￼￼￼￼￼￼￼￼￼￼￼￼￼￼￼￼￼￼￼￼￼￼￼￼￼￼￼￼￼￼￼￼￼￼￼￼￼￼￼￼￼￼￼￼￼￼￼￼￼￼￼￼￼￼￼￼￼￼￼￼￼￼￼￼￼￼￼￼￼￼￼￼￼￼￼￼￼￼￼￼￼￼￼￼￼￼￼￼￼￼￼￼￼￼￼￼￼￼￼￼￼￼￼￼￼￼￼￼￼￼￼￼￼￼￼￼￼￼￼￼￼￼￼￼￼￼￼￼￼￼￼￼￼￼￼￼￼￼￼￼￼￼￼￼￼￼￼￼￼￼￼￼￼￼￼￼￼￼￼￼￼￼￼￼￼￼￼￼￼￼￼￼￼￼￼￼￼￼Knudsen, PhD (Clever Science Officer, Clever Technology Officer), CleverPet took root and continues to grow in San Diego, California. In 2015 CleverPet won the Robot Launch global startup competition run by Silicon Valley Robotics. CleverPet uses advanced cognitive and behavioral science techniques to develop elegant, durable technology solutions for the animals we love.